Hartlepool United and Middlesbrough players hustle for free space while waiting for a corner to be delivered. All pictures by Frank Reid. 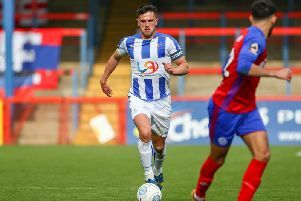 Things had to change at Hartlepool United. If things carried on the way they were this time last year, Pools would be no more. Had Jeff Stelling and Craig Hignett not done their bit, Raj Singh not put his hand in his pocket, Matthew Bates not worked minor miracles, a number of players not stepped up to the plate – at best we’d be talking about local derbies in the National League North with Darlington, at worst some randomly named phoenix club, not the historic, great institution so many have an unwavering love affair with. They had to change – and change they have. Change has come at the top with an ownership switch, new support staff structure behind the scenes, training grounds have been moved, players have come, players have gone. There is a freshness about Pools and it’s difficult not to get excited about what might lie in wait with the National League season just five days away. Here we take a look at three under the radar changes that have taken place this summer, away from the obvious. Now, I’m not about to suggest business at Hartlepool United was unprofessional under previous regimes. I think you can all make your own minds up about that. What I will say, though, is this summer bills have been paid on time. Deals have been done, which are for the benefit of the club, and the club alone. Commercially the club is growing. Shirt sales are breaking recent records, season ticket sales have been on a similar upward curve. Negotiations with suppliers, potential investors and prospective new additions have been conducted in a manner befitting of a club that has been operating at a relatively high-profile level for more than 100 years. Things have changed and long may it continue. On to footballing matters, players have been extensively scouted, characters referenced and the right deals struck for the club which not only improve the product for fans, but also work within a budget that will not see the bank or creditors come knocking. Never Say Die. It’s on the kits, it’s on the corner flags, it’s on the terraces. The phrase is ingrained in the DNA of Hartlepool United. While hope was sucked out of the club, the fans had to pick up the pieces. Now, under Singh, Stelling, Mark Maguire, Hignett and Bates, Pools have a group of individuals who they can believe in. This can never been said with 100% certainty but speaking to every one of them, you get the feeling they all want success at Pools and are willing to work and commit to achieve it. Knowing that firm foundation is in place, gives some degree of confidence things will click on the park. Players no longer live in fear of their next paycheck. Now there is no excuse. For two years now Hartlepool United has been exactly that in name, but not in nature. It’s been fractured on the terraces, on the field and in the halls of power at Victoria Park. It’s been operating as a shell, a shadow of its former self. Now among the staff there seems to be a belief. You can sense it with the supporters, too. Yes, Salford have megabucks, yes 14 teams finished above Pools last season and yes the squad has been put together on a bit of a shoestring. They won’t say it publicly but you can tell the dressing room knows they have the quality to make the fifth tier play-offs. I think many see that as the benchmark. They may have said it last season, but how many actually believed it. This time they’re keeping their mouths shut. Hopefully their football does the talking between now and May.